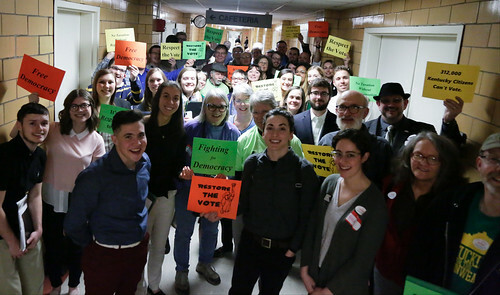 This year’s Madison County KFTC pie auction on March 14 was an amazing success that brought together the community and built up grassroots energy. People came out, baked pies, ate pies and joined each other in fellowship. In a December article in the New York Times1, Justice Ruth Bader Ginsberg’s daughter, Jane, states, “My mother strongly believes there won’t be true equality until men take full participation in child care and other household tasks.” And, in both of the recent movies on her life, you see Justice Ginsberg’s husband doing just that: taking on more housework, cooking, and providing childcare thus allowing his wife the room to spend more time working outside their home. Justice should heal. 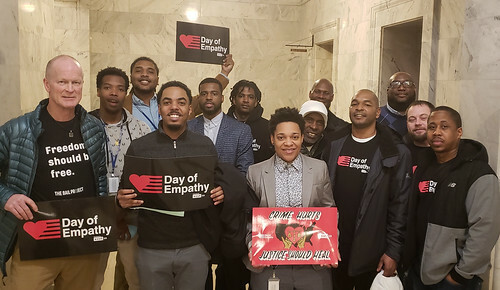 That's why we joined allies in Frankfort Tuesday for cut50's #DayofEmpathy. 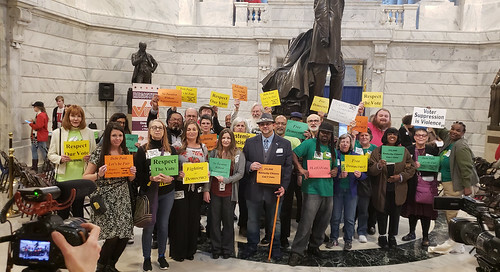 KFTC members joined allies from across the state in Frankfort on February 26 to take action for LGBTQ rights and attend the Fairness Rally. On Monday, members of the House Elections and Constitutional Amendments Committee heard a voting rights bill to restore the right to vote to people with felonies in their past who have served their debt to society. Primary sponsor Representative George Brown was joined by Representative Charles Booker and Representative Jason Nemes as a united and bipartisan front of legislators testifying in favor of the bill. Today, we had our first Voting Rights Coalition meeting! Twenty-six people from 19 organizations came out to get to know each other and to start to forge a path forward to win the right to vote of 312,000 Kentucky citizens with felonies in their past. There was a lot of good will and great ideas in the room and we're now together with a shared analysis and rough path forward. About 25 additional organizations are interested in joining the conversation or have been in conversation with us on the issue, but weren't able to make it out to this meeting. It's a solid start. Today nearly 100 KFTC members and close allies gathered in Frankfort to talk to legislators about restoring voting rights to people with felonies in their past and push for a constitutional amendment that would recognize the right to vote of 312,000 Kentuckians who can't vote now because of our felony disenfranchisement law that is out of step with the rest of the United States. Dozens of the people who came out talked about the issue from first hand experience, having the right to vote in Kentucky taken away from them. We had meetings with over 30 legislators and built up support for the issue with Democrats and Republicans alike, including many legislators who just got elected for the first time this last November. The vast majority of senators and representatives we talked to said they were in favor of restoring voting rights.